Dividing retirement accounts can be one of the most polarizing issues in a dissolution of marriage, particularly since retirement accounts tend to be one of the largest marital assets involved. In order for a spouse to receive their share of the “nest egg” the court must enter an order directing the plan administrator to make payments to the nonparticipant spouse. If this order isn’t drafted properly or submitted in a timely manner, you could face significant repercussions, including hefty taxes and penalties or even loss of the benefits entirely if your spouse predeceases you. So How Do You Secure Your Marital Share of Your Spouse’s Retirement? For certain employment related retirement benefits (i.e. pensions or deferred compensation plans), a Domestic Relations Order (“DRO”) must meet the requirements of a Qualified Domestic Relations Order (“QDRO”). With a QDRO, the court is authorizing an employer to award a nonparticipant spouse (called an “Alternate Payee”) his or her share of the other spouse’s retirement account based on the terms of the parties’ divorce. If you are getting a divorce in the Commonwealth, Virginia law will govern how and what benefits are assigned to the nonparticipant spouse. However, there are two other bodies of law that affect the administration and enforceability of employer pension plans: 1) ERISA and 2) the Internal Revenue Code. Under ERISA and the Code, a QDRO must be entered to allow the plan administrator to distribute the funds. Moreover, each plan has its own rules and requirements governing the contents of a QDRO. Given the variation involved from plan to plan, it is important to obtain and understand the plan rules and requirements prior to endorsing a Settlement Agreement or proceeding with a hearing on Equitable Distribution (Virginia’s process for dividing up marital assets). The Employee Retirement Income Security Act of 1974 (“ERISA”) was enacted in order to protect the interests of employees (and their beneficiaries) who are enrolled in employee benefit plans, and to ensure that employees receive the pensions and group-sponsored welfare benefits that have been promised by their employers. ERISA provides the procedural rules for securing these benefits for the nonparticipant spouse. 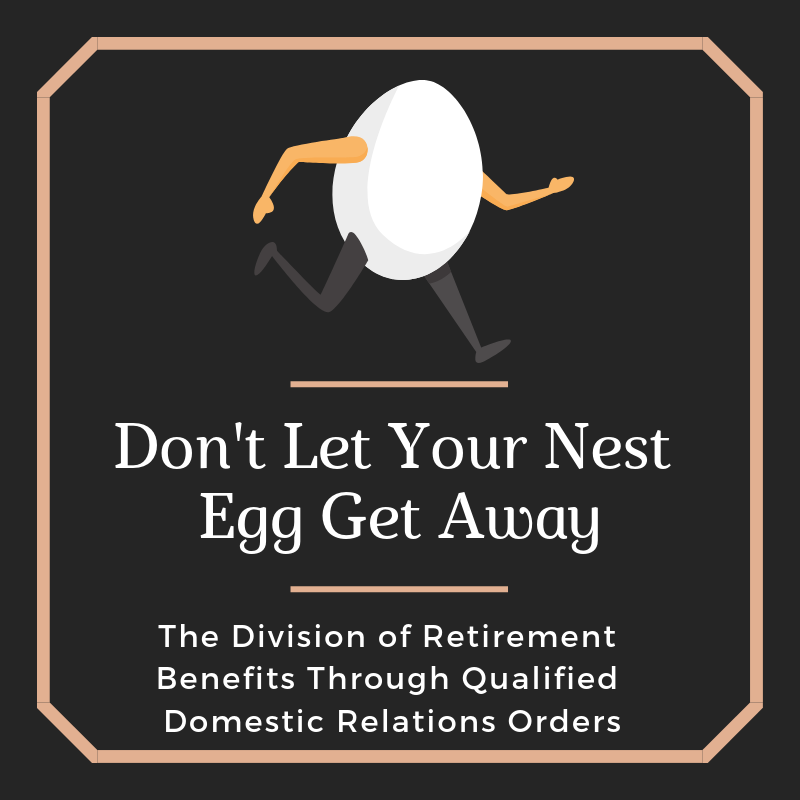 Failure to satisfy these procedural requirements will prevent your Domestic Relations Order from being “Qualified” and therefore recognized by the pension plan administrator. Upon submission to the plan administrator, he or she will review the proposed order to ensure that it complies with federal law and the terms of the plan. What plans are governed by ERISA? ERISA applies to employee pension benefit plans, meaning: (1) defined benefit plans, and (2) defined contribution plans. A defined benefit plan guarantees that each participant is paid a specific benefit at retirement and is usually based on a formula that takes into account various factors such as the number of years a participant works for the employer and the participant’s salary. Typically, participants under a defined benefit plan receive periodic payments for the participant’s life beginning at what the plan calls “normal retirement age.” These recurring payments are generally known as an “annuity.” These annuities may increase over time, either before or after the participant starts receiving benefits, due to increases in salary, crediting of additional years working for the employer, or cost of living adjustments (COLA). A defined contribution plan, by contrast, is a type of retirement plan that provides for an individual account for each participant that allows employees to invest or choose their own retirement investments. The participant’s benefits are based solely on the amount contributed to the participant’s account and any income, expenses, gains or losses. Contributions can be solely made by the employee or some employers proportionately match an employee’s contributions up to a certain percentage. Examples of defined contribution plans include profit sharing plans (like 401(k) plans), employee stock ownership plans (ESOPs), and money purchase plans. A participant’s basic retirement benefit in a defined contribution plan is the amount in his or her account at any given time. This is generally known as the participant’s “account balance.” Generally, this benefit is paid in the form of a lump sum payment of the entire account balance. How is the Internal Revenue Code implicated? The IRC provides the tax consequences for implementation of a QDRO. A former spouse may be able to roll over tax-free all or part of a distribution from a qualified retirement plan that he or she received under a QDRO. If a person receiving QDRO payments is either the employee's spouse or former spouse, then he or she can roll it over, just as if he or she were the employee receiving a plan distribution and choosing to roll it over. Why is a QDRO important? Enforceability, provision of survivor benefits, and protection against hefty tax consequences and penalties are just a few of the reasons that a Qualified Domestic Relations Order is imperative. Federal law requires that all retirement plans (whether a defined benefit plan or defined contribution plan) provides survivor benefits payable under the retirement plan for the benefit of the participant’s spouse. Each plan offers different survivor benefits and it’s important to understand what your specific plan offers. In the event that a participant spouse passes away before his or her annuity starting date, the plan must then pay the surviving spouse a monthly survivor benefit. For defined contribution plans (like most 401(k) plans), they are required to pay any balance remaining in the participant’s account to the surviving spouse upon the participant’s death. A properly drafted QDRO can protect a former spouse by requiring the former spouse to be treated as the participant’s surviving spouse for all or any part of the survivor benefits payable after the participant’s death. Without a survivor annuity, a former spouse’s benefit will cease at the death of the participant. Moreover, a QDRO is necessary to transfer the nonparticipant’s share without incurring hefty penalties and tax charges. You may want to consult with a tax attorney, or discuss the tax implications with your tax professional or certified public accountant (CPA). What happens after a DRO is submitted to the plan administrator? The plan administrator is required to notify the parties, in writing, of the administrator’s determination as to whether the order constitutes a “Qualified” Domestic Relations Order. Are Military Pension Plans Governed by ERISA and Require a QDRO? No, military pensions are governed by the National Defense Authorization Act (NDAA) and the Uniformed Services Former Spouse Protection Act (USFSPA) and have different rules and regulations than the pensions discussed in this article. The plan administrator is required to reject a DRO if it fails to comply with both federal law and the pension plan’s own QDRO procedures. A former spouse’s rights to their spouse’s retirement benefits are terminated upon divorce. It is the QDRO that re-secures the former spouse’s rights. It is imperative that you hire an experienced attorney, to 1) understand the nature of the retirement benefits, 2) properly draft a DRO in compliance with federal law and the plan’s requirements, and 3) accomplish the purposes for which the retirement benefits are being divided. Determining the best manner of division will depend on many factors, including the type of retirement plan, the nature of the benefits, and why you are seeking to divide those benefits. As one of your largest marital assets, you want to ensure that your rights are thoroughly protected. As you can see, understanding retirement benefits and division of marital assets is complex and can be overwhelming to anyone going through a divorce. Having an experienced family law attorney on your side will help you secure your financial future and provide you with peace of mind.